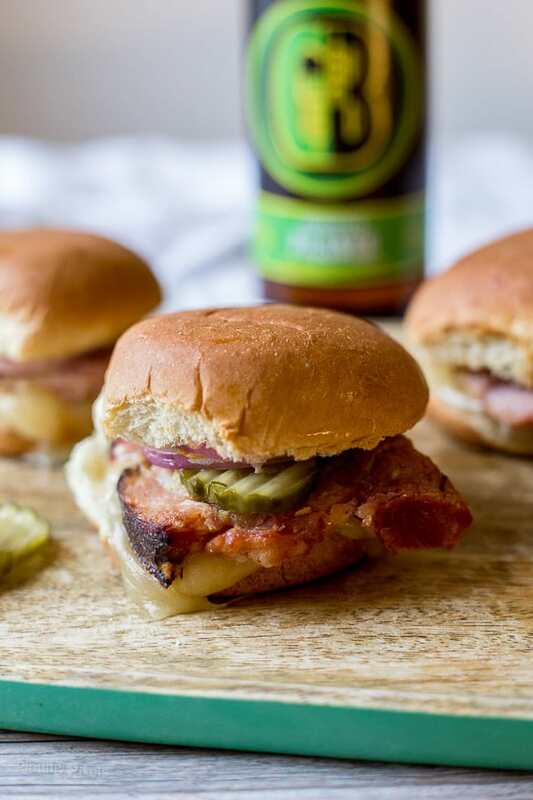 These Ham and Gruyere Sliders are a quick and easy party appetizer with meat and cheese melted between moist, toasted slider buns. Topped with a homemade raspberry mayo, brown mustard, sweet pickles and sliced red onions. Whether it’s during a game or you’re hosting a party, you’ll want a quick and easy, shareable appetizers. Simply assemble and bake these Ham and Gruyere Skilers, and within minutes you’ll be back in front of the game or socializing. There are lots of flavor combos going on here. First is the natural choice of ham and cheese. Gruyere specifically adds a fruity and nutty flavor, while the firmer texture holds up well for melting. Add mayo combined with raspberry preserves for a sweet, savory and tart combo wedged between moist, crisp buns. Speaking of buns, small slider buns such as Hawaiin rolls are a wonderful choice for these ham and gruyere sliders. They’re soft and fluffy, and just the right size for slider appetizers. Most have a hint of sweetness that’s ideal for any meat and flavor combination. 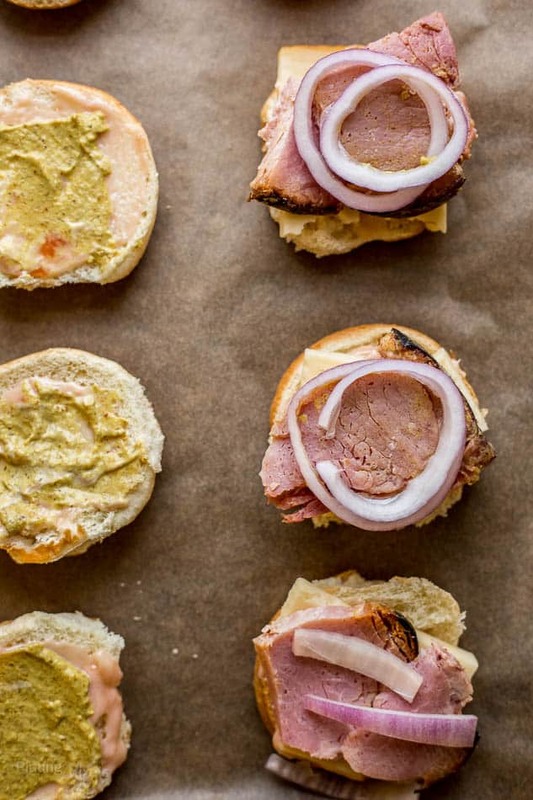 Serve these Ham and Gruyere Sliders during the big game, or for any occasion that requires feeding a hungry group. Pair them with beer for gourmet snacking right in your own living room. This recipe is a great way to use up leftover ham from holidays or special occasions. Let’s face it when we make a big roast there are always leftovers and you certainly don’t want to waste them. There are plenty of ways to use up leftover ham but by making them into ham and gruyere sliders you can have a delicious, easy and satisfying meal ready in no time. The great thing about these sliders is that they are so easy to customize. You can add a whole array of condiments from BBQ sauce, garlic mayo, ketchup, and hot sauce just choose your favorites and make them your own. Gruyere is a great cheese for these sliders, it’s strong without being overpowering and keeps it’s flavor when melted. If you can’t find gruyere you could also use fontina cheese, provolone or even cheddar. 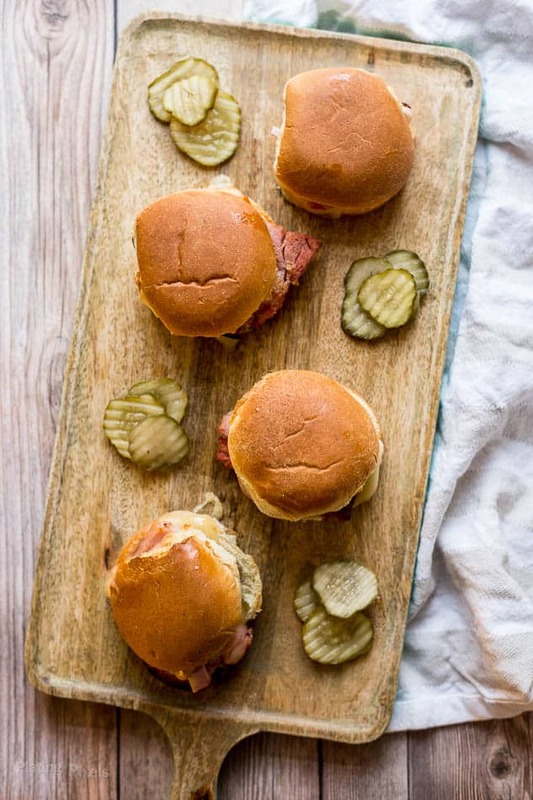 If you’re entertaining a crowd then ham and gruyere sliders are a great option for a low prep and delicious party snack. You can easily prep these in advance and you can easily double or triple the ingredients for the right amount of servings you need. To prep ahead just follow the directions without baking and place covered in the fridge until ready to bake. Flavor profiles: Meaty and buttery cheese flavor paired with sweet and tangy mayo. Texture: Gooey cheese and tender meat on soft, toasted slider buns. Meat and cheese melted between moist, toasted slider buns. Topped with a homemade raspberry mayo, brown mustard, sweet pickles and sliced red onions. Preheat oven to 400° F. In a small bowl mix together mayo and preserves. Evenly spread onto both sides of separated slider buns, then top with mustard. Place bottom halves on a large baking sheet. Evenly top with cheese, ham and onion. Top with other half of buns and roast for 10 minutes, or until cheese is melted and buns are toasted. Remove from oven, garnish with pickles and serve immediately. This recipe is so easy but the flavors are so bold and complex! What a stroke of genius to combine the brown mustard and raspberry preserves! Wow Toni, thanks so much and appreciate the positive feedback! It doesn’t get much better than gruyere. And its perfect partner is ham! Oh how I want one of these sliders! OMG did you say raspberry mayo? That sounds amazing! I need to make it asap! I totally did and hope you do! Yum! 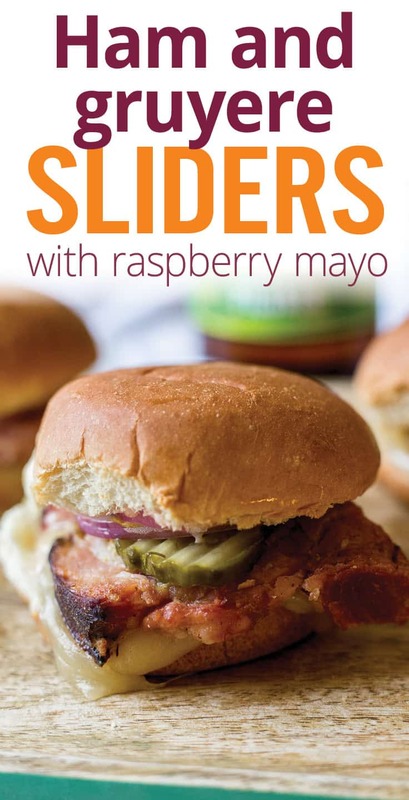 I love the sweet touch of raspberry may on these classic sliders! Thanks so much for the feedback Danielle! Yum! I love the idea of combining a raspberry mayo with ham and gruyere. The little bit of mustard also speaks to me. These flavors are spectacular together! I find meat and fruit preserves often make a great combo. Thanks and glad you liked the recipe Jenni! 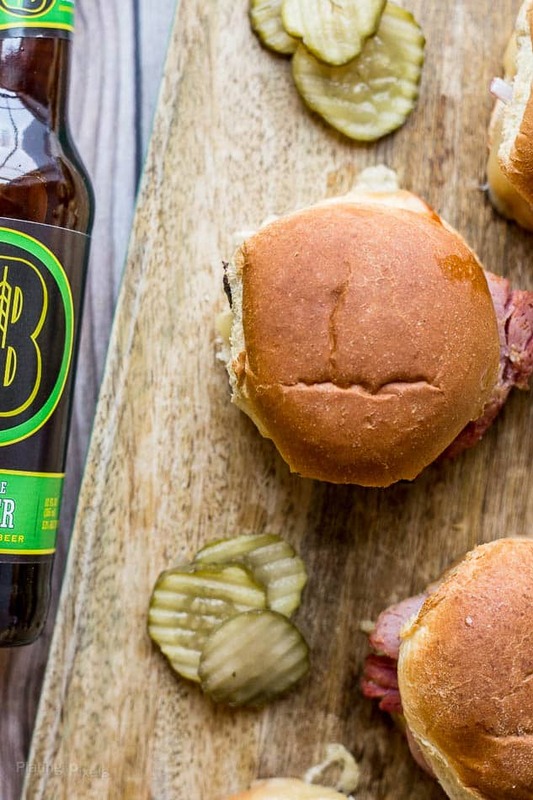 Love the big flavors going on with these sliders! They are sure to be a hit with everyone and will be perfect game day food! LOVE the combination of these sliders. The raspberry mayo with gruyere is genius. Why didn’t I think of that? I am sooooo making these! These look, in a word, AWESOME! I loooove gruyere but I never really think to use it in recipes! Also, that raspberry mayo sounds yummy!